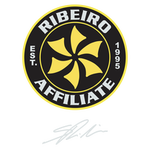 Sensei Saulo and Xande Ribeiro, Brazilian brothers, WorldChampions and members of BJJ hall of Fame, redefine the sport and methodology of teaching with their revolutionary system: FlowPressureFinish. In the first 3months you will find muscles on your body that were sleeping, learn how to breathe, stretch, make new friends and develop a new habit. You will realize that one very important aspect of your life were missing: Self-Discipline. If you spend the next 6months working on it and show up for classes at least 2x/week, you will experience a great transformation on your body, mind and resilience. You will feel 100% in the moment because Jiu-Jitsu gives you no time to think. It’s all about action/reaction that you will lean with our Drills. Coordinate movements between two training partners to simulate sparring and make you get used to physical exchange. Close to your 1year of training you will feel that certainly positions you don’t need to think to apply, become your muscle memory, that’s when everything starts to make sense and Jiu-Jitsu become too much fun! Arm locks, chokes and defenses for days! Our best seeker book, Jiu-Jitsu University will give you the mindset of what to expect in which belt, monitoring your progress and go over the basic positions that you must know in order to advance quickly and defend yourself. The greatest lesson in Jiu-Jitsu is learn how to TAP, recognize that your training partner was better that day and there’s always tomorrow. In the end the loser will be our ego. Let’s smash him together. See you on the mat!